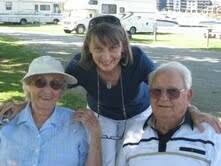 Yesterday my dad, whom the kids called Granddad, went to be with the Lord at age 95. He was vigorous, cheerful, fun-loving, and strong to the end. And though the end caught us by surprise, I don’t think it surprised him. He was ready. He leaves an older sister, a younger brother, four children, fourteen grandchildren, numerous great-grandchildren, and my dear mother. We will all catch up to him in due time, Lord willing. My earliest memories of my dad involve play. He invented games for us and had no end of patience when it came to balancing us on his hands and playing silly games. Bedtime was always a party. He took trouble to see that we kids were having fun, and planning trips and explores were his specialty. He was a pilot, and he loved to “bore holes.” I remember the thrill of getting to unpack his B4 bag when he got home from trips. It was full of zippers and pockets, and there was always something for us in those pockets. I couldn’t help but think of that old gospel hymn today: “When I die, hallelujah by and by, I’ll fly away!” Dad flew away yesterday. He taught us kids to water ski when I was 9 or 10 years old. He got out in the water with us, and came up with his skis outside ours, holding on to the same rope. Then once he thought we had the hang of it, he would drop off and let us solo. That’s how he did things. Boating, snowmobiling, pulling a trailer around the country on camping trips. He loved it all. Especially the water. Dad was a real character, full of stories. He loved a joke and was such a tease. Doug saved up jokes to swap with him when we would visit. Corny jokes! He had a wonderful big laugh. When my mother-in-law Bessie was visiting one time, he was going to give her a ride somewhere and told her he would go get out the motorcyle. Of course he was teasing, but he had her mighty worried! She recounted that story to us many times. He was faithful and devoted to my mom. He worked hard, he loved his kids, and he loved the Lord. He read to Mom out of their daily devotional every morning, and I have no doubt he did not skip it yesterday. Once, between waking and sleeping, he thought he had a foretaste of heaven. He was looking through a crack between slats or boards, and he could see a glorious paradise like nothing on earth. It was just for a moment, and then it was gone. He was a do-it-yourself kind of man. When he was a boy, his dad had him take a car engine completely apart and put it back together again. He built the house he died in. He could fix just about anything. And he loved to figure things out. Dad knew how to manage his money. He never spent more than he had, and he left behind no debts. But he was generous, always looking for ways to help needy folks. I don’t know how many times he slipped me a check as I went out the door, and I was not the only recipient of his generosity. He was full of theological questions, looking forward to the day when he would understand it all. Evolution was his pet peeve, annoyed him no end! He loved Logos School and was a faithful supporter from the early days, contributing in countless ways to make it succeed. He took an interest in all we were doing, always a participant, never a bystander. He loved his grandkids and delighted in showing them a good time, building a zip line for them on his property, giving them rides on the motorcycle or in the bucket of his tractor. He loved to see them have fun. I will miss my dad. He was a rock, and that isn’t just a metaphor. He has left us a large legacy of stories and story-loving which I hope my grandchildren will treasure up for their children. Even at our last visit, he told us a story we had never heard, and he was a great story teller. What a blessing he has been to and for us, our children and grandchildren. I thank God for his life and for his death, and trust that he is surprised at the size of his bank account in heaven. We are the richer for our time with him. God bless you, Dad! May God comfort you all. Love to you and your family, Mrs. Wilson. Thanks for sharing this post about your Dad. The peace of Christ be with you all. . .
I’m so sorry to hear about your dad’s death. He sounds like a granddad that I would have loved to have, too. Thank you for sharing. I’ll be praying for you all! May God’s peace continue to envelop you all as you say your goodbyes to this man who loved you and will be so missed. By God’s grace, the separation is temporary. Thank God, thank God. My heart aches for those of you left behind. It brings tears to my eyes to think that death is a bittersweet thing for our Lord, too, as He sympathizes with our loss while rejoicing with the ones who are now in His presence. I am so grateful that God kept Adam and Eve from eating of the Tree of Life, and that Jesus made a way for us all to be with Him for eternity. O Death, where is your sting? I pray you will find comfort in the One who loves you more than He loved His own life and His own glory. While your dad is in a far better place, I know that you will miss him very much. I have very fond memories of your dad. He was generous with his time and possessions. I remember well how he took Heather and me out on the lake to water ski (my first experience) and his patience. I did manage to get up on the skis 🙂 Seriously, you will be in my prayers, as will your mother and the rest of the family, who will be missing him now. He sounds like quite a man! You were blessed to have him as your father. May God comfort you and your family as you are temporarily parted from him. Just finished Condoleezza Rice’s book about her parents “Ordinary – Extraordinary People” it is a testament to devoted Christian parenting. It would be a comfort to your heart after the dust settles. May our Lord Jesus Christ get the glory. A life well lived and a legacy to admire. A pleasure to read a tribute about such a good person. What a wonderful man; God truly blesses us with people like your dad. Praying you find comfort and joy even during this time of earthly loss. He sounds like a wonderful man who will be sorely missed. Hugs to you and your family. Thank you for sharing these memories with us. You honor him and all your family with the telling of his story. What a blessing to have shared a lifetime of such love and joy. We have told our kids that when a loved one dies and goes to be with God this is sad to us, but not for them. We need God’s tender mercy and comfort, but they are happy as clams. I pray God’s warm arm of comfort keeps your tears from falling too heavy and too often. And that your father’s stories will continue to fill the generations of your clan with strength and joy. Because of Jesus’ blood, your father sees unspeakable wonders today. May you be comforted by his exceeding joy. He understands the “far” before “better” now. My heart aches and rejoices with you and yours as my dear father of 95 also went to be with his Lord recently. So many wonderful memories and such a blessed legacy. Thank you for sharing, Nancy. May God grant you sweet fellowship with those here who love and were loved by your father, and the hope of fellowship more sweet than we can imagine when we join them! Thank you all for your very kind words! I truly appreciate it! Thanks for this beautiful eulogy. I’m sorry for your loss, but rejoice with you for father’s gain. With each dear one we lose, Heaven becomes more precious and vivid to our soul, does it not? What a wonderful man, and what precious memories. Your mom will be in my prayers. I’m very sorry for your loss, Mrs. Wilson. Hugs from the Deep South! That is so beautiful indeed, Nancy. Sorry to hear of your loss. We will keep your family in our prayers. What a wonderful man he sounds like. His legacy can live on in you all. Thank you for giving us a sweet picture of who your dad was. He sounds like a wonderful man. I loved reading about your dad. I am happy to know that he lived a long life and created many special memories for your family. Thank you for sharing your father’s story. He is a blessing to us all. I am sure he will complete Our Father’s joy in heaven. Heaven is even a happier place now! What wonderful life memories to pass along to the next generation. May God comfort you and your family.